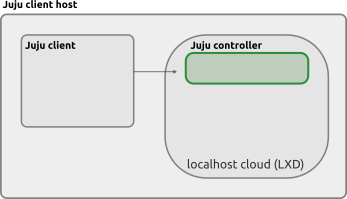 The Juju controller is the initial cloud instance which is created in order for Juju to gain access to a cloud. It is created by having the Juju client contact the cloud’s API. The controller is a central management node for the chosen cloud, taking care of all operations requested by the Juju client. Multiple clouds (and thus controllers) are possible and each one may contain multiple models and users. Furthermore, since v.2.6.0, a controller can add to it a model which is hosted in another cloud. The ‘controller’ model is the management model and is intended to contain a single machine, the actual controller. If controller high availability is enabled then multiple machines would reside in the ‘controller’ model. All other models are considered regular and are used to run workloads. From v.2.6.0 onwards, a model can be added to a controller that is hosted on a cloud other than the one that hosts the ‘controller’ model. A subordinate charm is a charm that augments the functionality of another regular charm, which in this context becomes known as the principle charm. When a subordinate charm is deployed no units are created. This happens only once a relation has been established between the principal and the subordinate. A Juju bundle is a collection of charms which have been carefully combined and configured in order to automate a multi-charm solution. For example, a WordPress bundle may include the ‘wordpress’ charm, the ‘mysql’ charm, and the relation between them. The operations are transparent to Juju and so the deployment can continue to be managed by Juju as if everything was performed manually. See Charm bundles for more information. A leader (or application leader) is the application unit that is the authoritative source for an application’s status and configuration. Every application is guaranteed to have at most one leader at any given time. Unit agents will each seek to acquire leadership, and maintain it while they have it or wait for the current leader to drop out. The leader is denoted by an asterisk in the output to juju status. See Implementing leadership for more details. An endpoint (or application endpoint) is used to connect to another application’s endpoint in order to form a relation. An endpoint is defined in a charm’s metadata.yaml by the collection of three properties: a role, a name, and an interface. requires: The endpoint can optionally make use of services represented by another charm’s endpoint over the given interface. provides: The endpoint represents a service that another charm’s endpoint can make use of over the given interface. peers: The endpoint can coexist with another charm’s endpoint in a peer-to-peer manner (i.e. only between units of the same application). This role is often used in a cluster or high availability context. Here, there are three ‘requires’ endpoints (‘db’, ‘nfs’, and ‘cache’), one ‘provides’ endpoint (‘website’), and one ‘peers’ endpoint (‘loadbalancer’). For instance, we can say that “the ‘db’ endpoint can make use of services offered by another charm over the ‘mysql’ interface”. Despite the term ‘requires’, the three cited endpoints are not hard requirements for the ‘wordpress’ charm. You will need to read the charm’s entry in the Charm Store (e.g. wordpress) to discover actual requirements as well as how the charm works. For instance, it is not obvious that the ‘wordpress’ charm comes bundled with an HTTP server (nginx), making a separate HTTP-based charm not strictly necessary. Charms contain the intelligence necessary for connecting different applications together. These inter-application connections are called relations, and they are formed by connecting the applications’ endpoints. Endpoints can only be connected if they support the same interface and are of a compatible role (requires to provides, provides to requires, peers to peers). For example, the ‘wordpress’ charm supports, among others, an ‘http’ interface (“provides” the website) and a ‘mysql’ interface (“requires” a database). Any other application which also has such interfaces can connect to this charm in a meaningful way. Some of the above application units show unused interfaces. It is the overall purpose of the installation which will dictate what interfaces get used. Some relation types are required by the main charm (‘wordpress’ here) while some relation types are optional. A charm’s entry in the Charm Store (e.g. wordpress) will expose such details. The Juju client is command line interface (CLI) software that is used to manage Juju, whether as an administrator or as a regular user. It is installed onto one’s personal workstation. This software connects to Juju controllers and is used to issue commands that deploy and manage application units running on cloud instances. In general, all agents track state changes, respond to those changes, and pass updated information back to the controller. 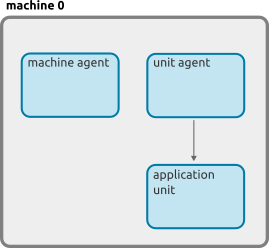 A model’s status (status command) is built up from the communication between a controller and all the agents running in that model. Agents are also responsible for all logging that goes on in Juju (see Model logs for details). The agent’s software version is generally consistent across a controller (and its models) and is thus determined at controller-creation time. By default the agent uses the same version as that of the local Juju client but this can be tweaked if desired. See Agent versions and streams for how to do this.